When it comes to dinner, I’m an obsessive planner. With a full time job and an hour commute and two kids, my dinnertime meals are regimented. But lunch is more spur of the moment. Not exactly an afterthought, but definitely more of a “What do I feel like eating today?” meal. And sometimes what I feel like eating is soup. Use good broth. You CAN make soup from water, but if you’re looking for a fast soup, a good broth is essential. Making your own is great, but I also like the flavors of Trader Joe’s Organic Free-Range Chicken Broth (Not reduced sodium), and Kitchen Basics Chicken Stock (Reduced Sodium OK in this case). Use add-ins that add a lot of up front flavor. A carrot will yield its secret over time, but if you’re looking for fast, you want to add ingredients that carry a lot of flavor from the start. This Mexican-inspired soup uses salsa and chilies to add a big punch of flavor. Toppings! Plain soup is just that – plain. Toppings take the soup to a whole new level, like in this cauliflower soup recipe. This Chicken Tortilla Soup gets tortillas, cheese, avocados, cilantro – the possibilities are endless. This easy chicken tortilla soup is perfect any time you want a quick or last-minute meal. Combine the broth, chicken, salsa, corn and jalapenos in a large pot. Heat over low heat for 15 minutes, or until the flavors combine. Salt to taste. Toast the tortillas (I toast them directly on my gas burner) and cut into strips. Slice the avocado. 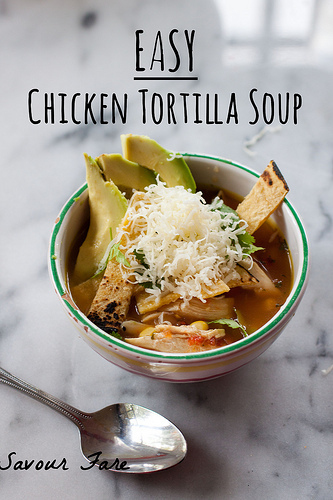 Serve soup topped with tortilla strips, sliced avocado, cheese and chopped cilantro.